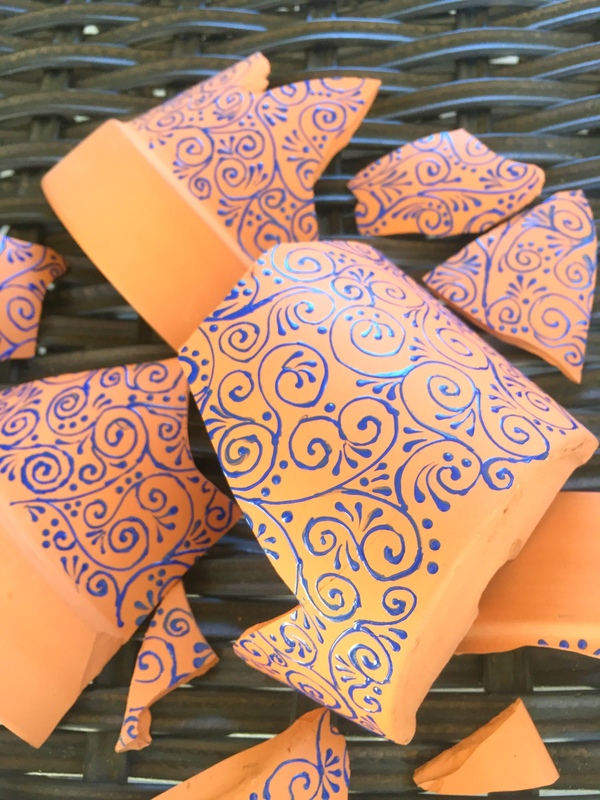 Few months ago, I decorated a Terracotta flower-pot with all my heart.. taking out couple of minutes here and there .. working on it for around a week. Finally I had it almost finished… At least my part was finished. I wanted my hubby to paint the top strap with white paint as he was already doing some woodworking project using white paint. So my almost finished masterpiece was sitting in my backyard patio, looking all pretty, excited to be used and a very good prospect for another DIY post. Until… it was broken!! I was sitting in my living room watching TV when I heard the sound, I turned and saw my husband standing next to my broken hard work and smiling. He said..” Where was it kept? I swear I didn’t even touch it. I don’t know how it fell down”. I don’t think I was heartbroken that very moment.. it took me some time to process. I said ‘its okay. I will clean up’ and started to gather all the pieces. When I was done collecting bit and pieces of my shattered project, I just couldn’t bring myself to throw this trash. It’s already been couple of months since this incident and I still have the broken pieces sitting in a backyard chest. I feel so sad for loosing my lovely pot. I wonder how I managed to keep my cool. But well.. at least now I know that deep down I have some patience in me. Did something like this ever happened with you? How did you react? It looks beautiful none the less I would break I few pieces more and place them around some plants or in a dish as decoration. I have had something similar happen a few times and I must say I wish I would have reacted as great as you did. Great job. Oh wow! This is so awesome!! I don’t think I have enough pieces to make something as exquisite as these.. but I am definitely going to give it a try. Thanks a ton for the inspiring link. Such a shame… Use the pieces to mosaic something? Or create a miniature garden in a bigger pot, I’ve seen pics on google and stuff! :) I have a destructive cat. So much has been broken in the last year that I’ve given up. Most recently a photo frame… We did pick up some glue this past weekend to see what can be mended!